I am sitting in a pub that fancies itself rotten. I hope the food will justify its faux bohemian air and general pretensions to olde worldliness. The day has been a bit longer than anticipated. 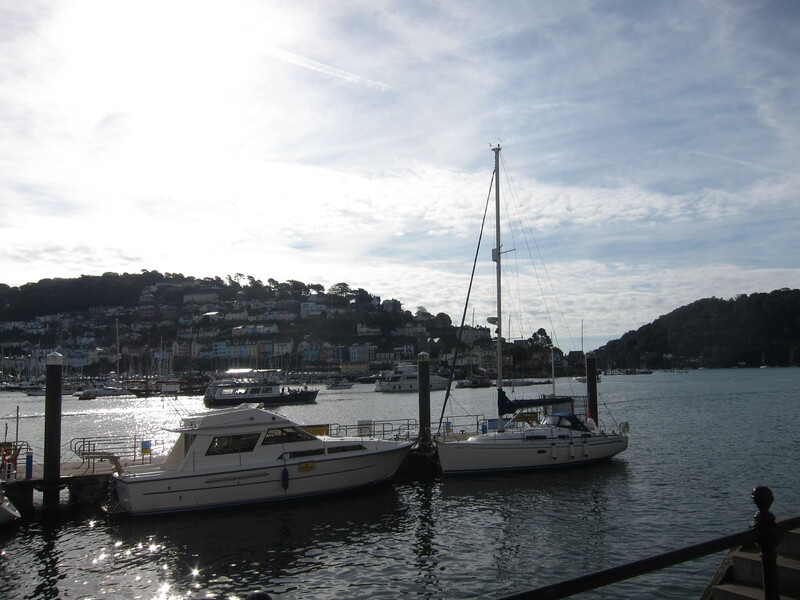 I caught the bus back into Dartmouth, again admiring the view of the coast from the upper deck and reached Dartmouth at around 9. The whole town was en fete for the three day regatta starting today, beginning with rowing. 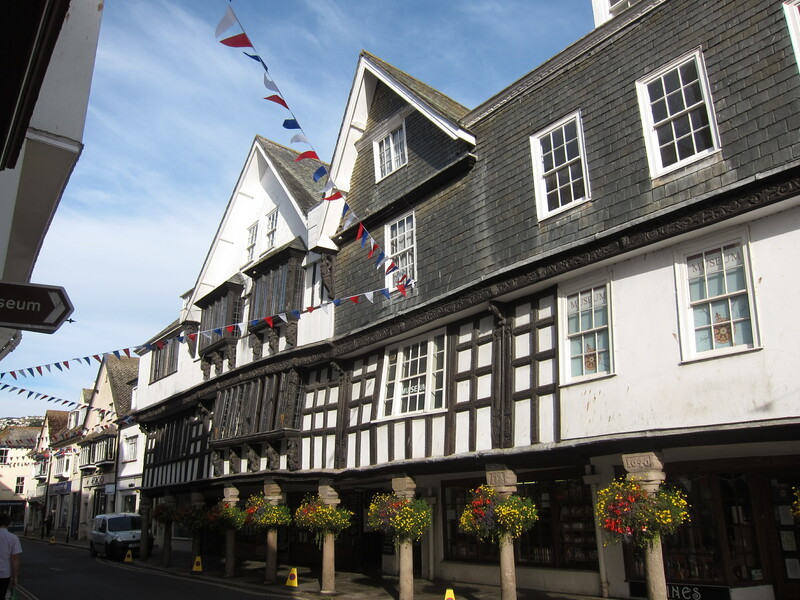 I had a little wander around a couple of side streets, in particular admiring the museum building which appears to be 16th century. 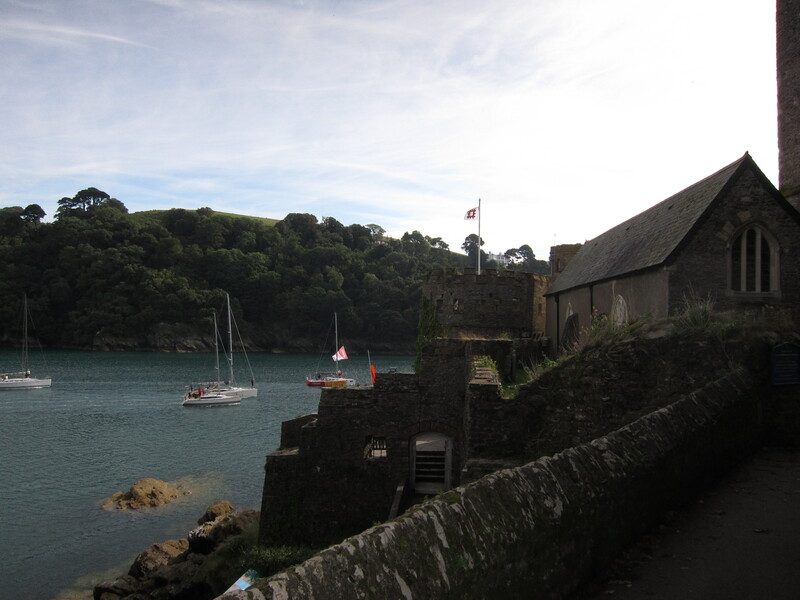 I walked along the embankment, passing the passenger ferry drop off where I finished yesterday’s walk and continued on towards Dartmouth Castle. There was a beautiful little church just under the castle, dedicated to St Petrox – interesting to see how far east the Cornish St Petroc has come. The path then leaves the road and continues the relentless up and down behaviour of yesterday. This carries on for the best part of 3 miles, with a mixture of woodland and bracken clothed hillsides. The path then turns inland to the village of Stoke Fleming, then meanders back and forth on either side of the road for another mile back to Strete where I stayed last night. The path is pretty clearly marked – naturally the only navigational mistake I made led me right through the middle of a herd of cows as far as a barbed wire covered gate. After Strete, the path drops down to a long spit towards Torcross. It wasn’t very appealing, mainly below the level of the road so no view. 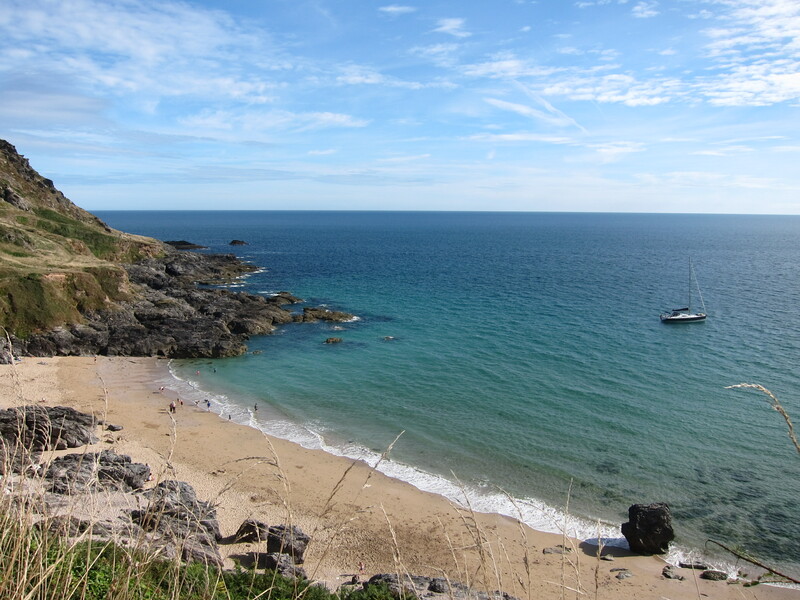 Torcross is full of cafes etc and I stopped at one of the prettiest before beginning a steep ascent up a flight of stone steps, over a headland and back down to the next bay at Hallsands. Then up again and along the side of the cliff. As I marched along, I was beginning to be a bit concerned about my ability to finish the week. My joints are all fine, even my knees, generally my weak point, are not giving me any trouble, but my feet are suffering. No strains, sprains, bruises or blisters, they just feel very heavy and tired, particularly if I have to walk on tarmac. 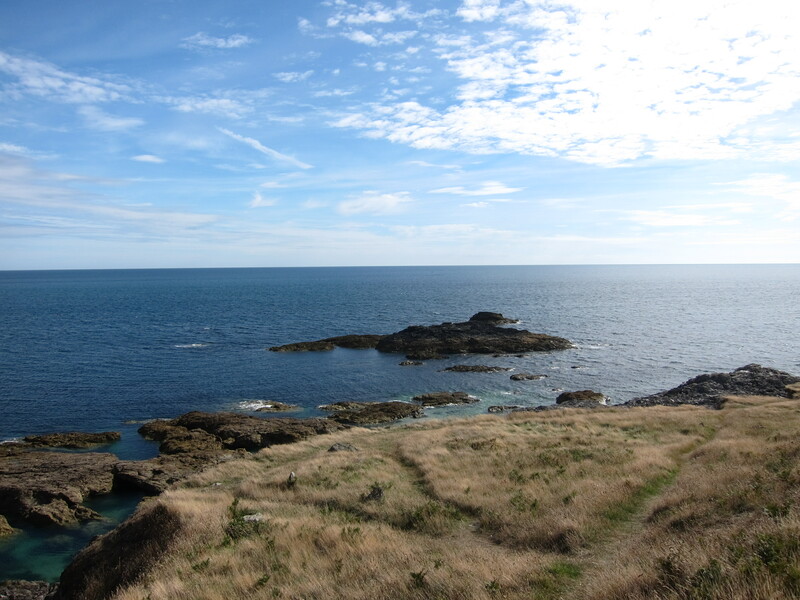 The path turns decidedly east out to the lighthouse at Start Point. I sat down to admire the amazing view – I could see right back to the mouth of the Dart and the headland beyond where I walked yesterday. I felt very lucky to have seen so much beauty and determined to ignore my feet. 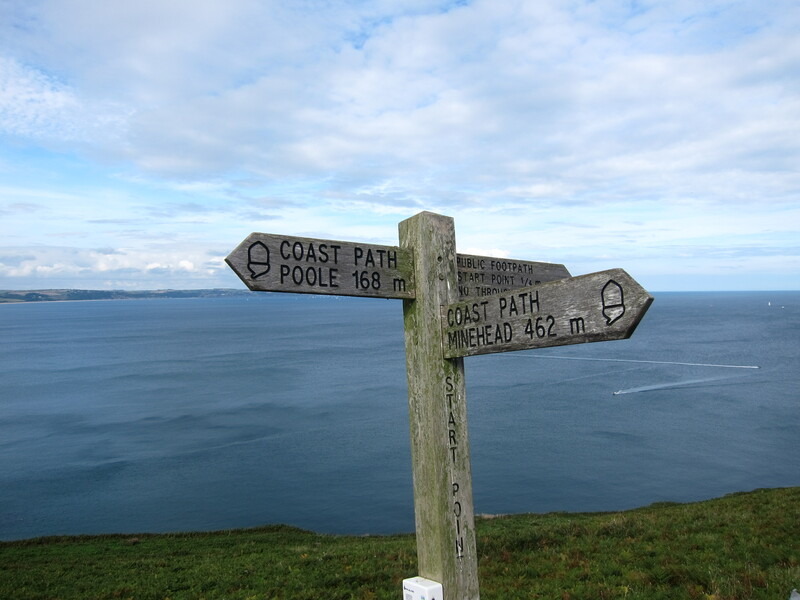 Just near Start Point is the first mile post I have seen that covers the whole South West Coast Path. Apparently, I have covered 168 miles from Poole, and have another 462 to go to Minehead. The coast path goes inland of the light house itself, but as one climbs over the saddle of the point, the wind hits full in the face. It was a beautiful afternoon, and the wind was not that strong but the reason fof the lighthouse was instantly recognisable. There are shoals of jagged rocks and the prevailing south-westerly wind would drive a ship straight onto them. The path becomes a bit tricky here, not that pleasing to someone nervous of heights as it clings to the cliff. I wouldn’t fancy doing it if it were wet or the wind were off shore. However, the upside was seeing seals lying on the rocks, sunning themselves. I carried on round the point and more safely inland. The path then drops down into Lannacombe Bay, and I was just congratulating myself on there being only a mile and a half to go (although with one very steep climb) when I saw the dreaded “path diverted” sign. What a nightmare – an extra 2. 5 miles including a good mile of narrow lane. I stomped off muttering and swearing. About quarter of a mile up the lane a very kind lady stopped and offered me a lift. I leapt in the car before she could clock my cow-patted boots and change her mind. Her kindness saved me a lot of time and pain. There was still another 2 miles to do up a very steep hill and long a bridle way into East Prawle. 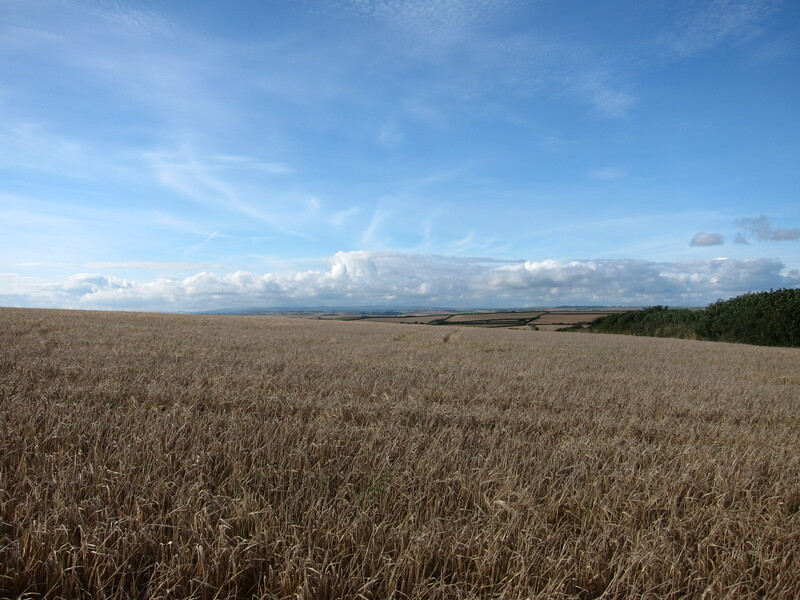 Over the flatter inland view, I could see over the bumper harvest north to Dartmoor. My b & b is a bit weird. It is the last house in the village and rather tumbledown in appearance. The landlord, who sounded like an elderly British gentleman on the phone turned out to be a very dishevelled, middle aged stubbled Kiwi. The place reeks of dogs, but the bedroom and bathroom are clean. I have just finished my meal – no, the pub does not deserve to be so pleased with itself.